This post is dedicated to my brothers Mitch and Pascal. I love them a lot and I am very proud about them. I had the urgent need to write it down since I got a very lovely message from my brother Pascal on Facebook which made me cry and reminded me how useless and stupid stubbornness and pride are. I became aware about it on my journey. On my journey I changed a lot of things and thought pattern. I have to add Pascal and I had not much contact anymore when I was in Germany. Why and how I cannot even remember. When I started to realize some things I wrote messages on Facebook to him. I just asked how was and that I was in Ireland. I saw that he read those messages but he didn't answer. When I came to Canada I knew that he would love Canada because he loved always animals and nature and is very interested in. So I continued to write to him. I guessed that he would response when he was ready for it. I have two younger brothers. Pascal is 4 years younger than I am and Mitch who is 7 years younger than I am. So I am the big sister :-). But the word "big" doesn't really fit. My brothers have the height of 1,97 m (Pascal) and 1,88 m (Mitch)... I have the female average height of 1,68 m.
Actually I am the shortest one in our family, apart from my grandmother. My brothers like to make fun about it :-). But when we were little I protected them, of course. When someone wanted to beat them up or wasn't nice to them, than all the fights between us at home didn't exist anymore. And it didn't matter if the person who wanted to beat them up was taller, bigger or older than I was. I would protect them even I was afraid. But better me than my brothers. 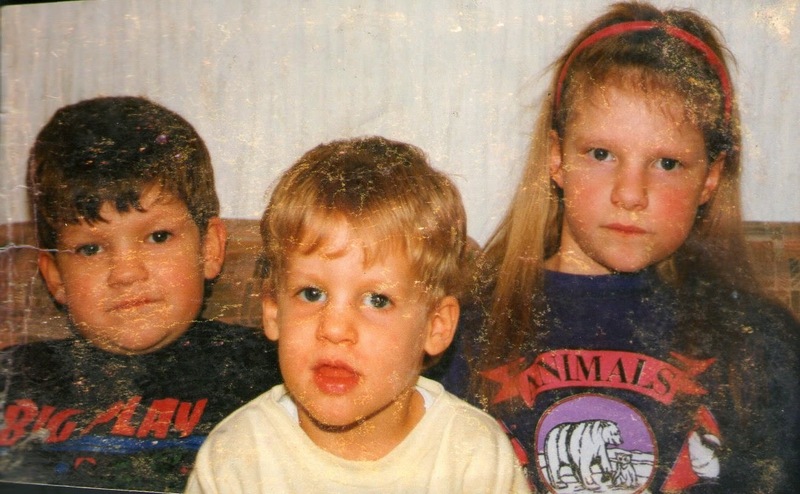 I was like a lion when someone would touch my brothers when we were little. Now they can protect me :-). Our characters are very different. I consider myself in the middle. I love my brothers for like they are. Mitch the youngest one is always the one who is very brave, self-driven and ambitious. He just does things. When he was around age 8 he wanted to become a Shaolin monk because he saw a them in the TV and a young boy from Europe got an education there. So he wrote to the Chinese embassy and some other place to get information how he could become a monk. So great. He has lots of fire energy like his zodiac lion. He has a great talent for learning languages. He is fluent in English, Spanish, Persian, Arab, French and a bit Polish. Due to he is the youngest one sometimes it wasn't easy for him. But that is probably the destiny of every youngest one :-). I went with him on vacation like in South France, visited him in Mexico and he visited me in Dublin which was great fun. I think it is easier to travel with a sibling because some things are very similar in sense of taste and thinking. I know that he understands me and I understand him. 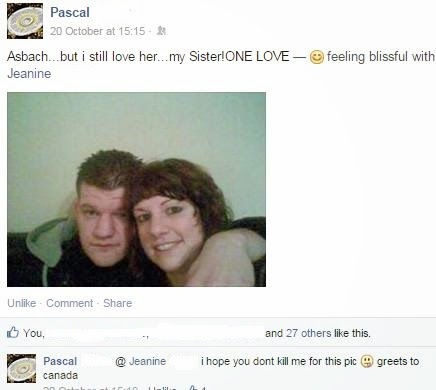 I am very proud of him like I am proud of Pascal. I could write more here but I would like to focus more of Pascal here because I feel in somethings responsible and his nice message made think... Also because our relationship was for a couple of time not great. Pascal was the child who was very interested in a lot of things like animals, science, history, football etc. His knowledge and memory for dates is impressive! I hated to play knowledge games with him. He knew everything... I was very mean and just changed the rules so that I could win. Well, that's maybe part of the "big" sister job. He also has the talent for languages. He taught himself Polish (!) and is fluent in it. He is also very social, sensible with others and has a great sense for justice. I still have a copy of a published letter he wrote to a newspaper because an article didn't explain properly some effort the school kids spent for a demonstration. In his letter he explained the effort and corrected what it really meant. Very cool. But his sense for justice was also the reason why he was often in trouble with authorities like teachers. Even his intentions were good it wasn't helpful for his career at school. He was also the child who got very quick excited about things and was very happy and wanted to know a lot. I wish he had more opportunities as child to live it really out. He was not that adventurous like Mitch and I. He was more careful. That was maybe a bit confusing for others because he was as child already very tall. Taller as the most kids in his class. I guess people often expect that tall people have to be very hard guys. I remember when we were with my dad in the zoo at the Delphinarium in Muenster. The guys asked which child would like to come and assist with the dolphins. Pascal raised his hand and went down the stairs. But when he was that close to them he feared to go over a bridge because it was too scary with the dolphins. So he turned and went up the stairs. My dad - who grow up like that fear is not really accepted - couldn't really understand at that time. At that time I was around 12 years old. Pascal was 8 years old. I remember I was in two minds. I felt sorry for Pascal and on the other hand I was also not happy. That is actually bad and if I think about it I feel in a way still responsible. If I could turn the time, I would hug him and say that everything is ok and that dolphins so close would also scare me. That would be at that time actually true. Whereas Mitch and I were often arguing when I lived at home (because I wore my sneakers for breakdance or what ever) Pascal and I were very close. But when I moved out it changed to start my education. Mitch and I became closer. 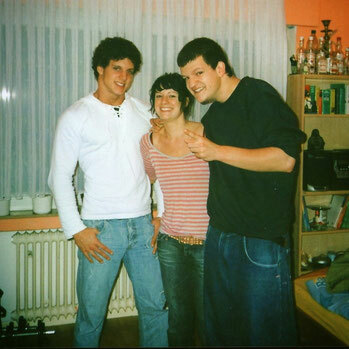 He visited me often in Muenster, we went together on holidays and on parties. We helped each other with different things. Pascal and I had not much contact anymore. We had not much to say. I was upset about some things. When he moved out and I visited him in his apartment. I saw that he needed a vacuum. So I bought him one on Amazon. He never said "thank you". I was disappointed. Other things happened. The distance between us got bigger and bigger. I was stubborn, he was stubborn. We had no contact anymore. He knew that I would leave Germany but he didn't contact me. I was even more disappointed and just thought that I expected that. On my journey I started to change. That is what I want. I wanted to get rid of some fears and also some thought pattern which kept me away from doing thing like having my own business. I wanted to be more open. I started to consider the relationship to Pascal as well. I couldn't even remember why we had not much contact anymore. Also when I skyped with Mitch he told me sometimes about Pascal and that he changed very positive. I recognized that I never thought about how he could feel. I mean I just saw the situation from my point of view and just mirrored everything. But I never thought about if he might have lots of stress, tension and if he was happy. And because of not saying "thank you" for a vacuum that cannot be a reason for having no contact to my brother. That is just ego, pride and stubbornness. I needed to go on a journey to realize that. But it is never too late. When I realized that I wrote him on Facebook when I was in Ireland. I just told him what I was doing and asked how he was. I didn't expect that he would answer. I just wanted that he knows that I think of him. I think having expectations is not good. Doing something nice just you expect to get something nice back is in my opinion quite selfish and naive. I saw that he got the message but he didn't answer. I was just glad that he got the message. I sent two more. The last one I wrote from Canada and sent also a photo. The one when I was sailing in Whistler. I knew he would love Canada because of all the animals and great nature. I saw that he got the message. He didn't answer. I just thought that I would continue writing to him. I knew he will answer when he was ready. And one day he was ready! He posted an old photo of me and him on my Facebook wall and wrote a very nice message. I was so touched that I started to cry. I wrote back to him and since than we are in contact again. He also considered some things and said that stubbornness isn't a good way. I am very happy about it that we are in contact again. Funny was that I told a couple of days before to my wwoofing partner Sarah about it and that I would continue writing to him and I was sure that he will answer. Coincidence? It was really great when I got my brothers message. It came at the right time when I started my Yoga Teacher Training. I see how foolish and selfish stubbornness and pride are. I already learnt a lot about that in the last month during my travel. Sometimes we don't even remember why we are angry with someone. I think compassion, understanding and forgiveness is very important. What can we lose to make the first step without any expectations? I am very proud about both of my brothers and exactly like they are. Very individual and strong characters. I love them. And even they are now big guys, if someone want to hurt them, I am still the lion! Das hast du sehr schön geschrieben, liebe Jeanine, ich bin sehr stolz auf euch 3. Hab dich lieb, oder habe euch lieb. Hi Roberto! Thank you very much! Yeah I think it is a good thing just to do the first step and ask how the other one is. That is everything. Just letting them know that we think and care about them. The right moment will come. You will feel it. I wish you all the best for that!